Thanks to Tomoson.com I got a chance to review the Printable United States Trivia Pack. 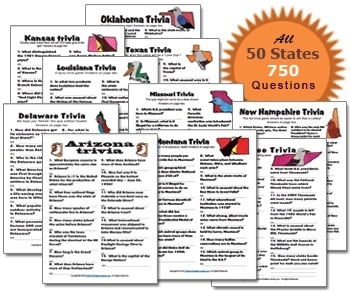 The Trivia Pack covers all 50 states and includes 15 trivia questions per state for a total of 750 questions. I've had a blast going through all of the trivia! A lot of the questions I already knew the answer to but there were some things I didn't know. The trivia packs cover different things about each state such as state nicknames, trees, flowers, capitals, history, funny facts, bizarre laws, local customs and more. What I love about the Python United States Trivia Pack is that it is down loadable. You receive the trivia pac threw email so it's green. You don't waste tons of paper by having them mailed to you. Instead you can answer just by looking at the screen, so that saves over 50 sheets of paper! Overall I really enjoyed the Trivia Pack. I learned some new things, and had a good time reading threw all the trivia. If you have any children who are learning about the United States then I really recommend getting the Python United States Trivia Pack. Disclosure: Thanks to Tomoson.com I received the trivia pack free of charge. All opinions expressed are my own and were not influenced in any way.